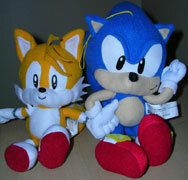 This page will still be covering past & present Sonic plushes from the USA. Eventually the old plushes will eventually all get catalogued, leaving upcoming pages with only 'modern' ones, but that time has not yet arrived. 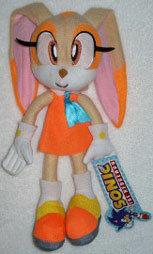 With companies like Great Eastern and Jazwares getting into the action, will 2009 be the year that USA plushes break out of the current funk and get back onto this page where people would reasonably want to collect them? Only time will tell, but you can keep watching right here for the photos of everything that's discovered. 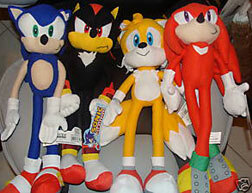 Great Eastern has recently entered the world of Sonic plush, by selling quite a few of them at conventions and other areas. These sometimes show up on ebay, but for high prices. The Knuckles may be their weakest one, or it could be a bad angle on him. His feet are rather fat, but the fists are nice and large. His spikes can't be determined from the front...but he has thumbs! A good touch to be sure. It's nice to the the USA getting a 'classic style set' as Europe has had some for quite some time. Anywhere other than Amazon / Ebay? FYE offline stores (usually in malls in the USA) are selling these in the Fall of 2009! Fact by ThessaTheCat. Photos by GE Animation, discovered by Berzerker. 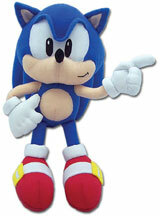 You can Buy Classic GE Entertainment Sonic Plushes right now with that link & Amazon. 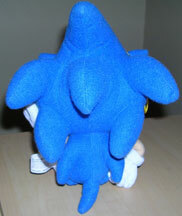 The backs of the plushes are nicely done as well, Sonic's spikes look just about as they do in the Sonic 2 game. 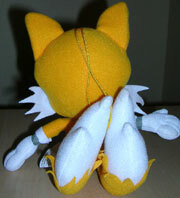 Tails' tails are a little flat, but the yellow edging is actually flappy, which is nice. This also shows they have strings on their heads for hanging. 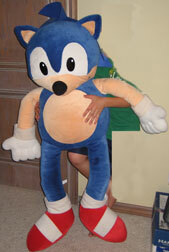 Here's a classic Sonic plush, uncommon by nature! 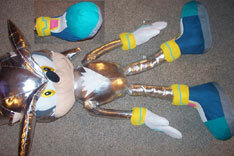 This plush is 52 inches high (a giant, especially in its time!) and was made by Caltoy. It is VERY heavy at 18-20 lbs. so there are probably only as many of them as there were Bestbuy stores at that time! 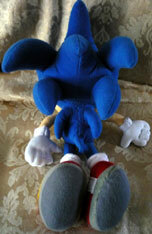 The plush itself is just ok, with a whopper nose and somewhat crude hands for the size. It is also a tad fat, and the case of 'big body' is really exposed in the shot from behind-- but over all pretty ok looking especially for something that big done that early on. 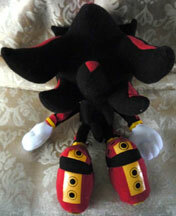 Certainly, it's a super interesting and rare plush to have! Discovered by Berzerker, back shot by Sonikku, full shot by Chris. 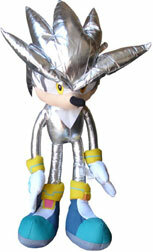 Here's another edition of the 'silver cloth Sonic plush'. ToyNetwork is still making these oddities, but they're changing around how they do it, so the plush appears here again to give you an idea of it. This one is 18 inches high, but it is understuffed. You'll often see them listed as a 'floppee' on ebay which is a legitimate plush-style, however it's debateable whether it's SUPPOSED to be that way! 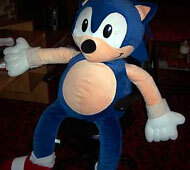 "Floppee" is usually reserved for pillow plushes or other 'boneless' types meant to be draped about...Sonic never really fit that category, so get at own risk. The next is that they've added gray fabric to the spike-under-sides, palms and shoe-soles for whatever reason. 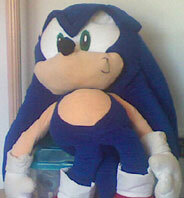 It also seems the ear-size on this plush is larger. 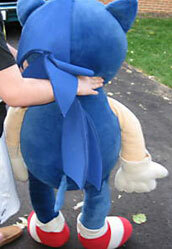 Plush is available in 2009, photo discovered by Berzerker. KellyToy, but you'll notice it is differently proportioned. Not nearly so oddly tall. Plus, he looks different from his prototype shot...perhaps a little better. They attended his glove and shoe details, and his eyes are indeed yellow. But why is he silver-tone? The game clearly depicted him as being white only. Supposedly these will range in height up to 6 ft (72 inches) but that has yet to be confirmed. If confirmed, it will be posted here. KellyToy info provided by Encas. 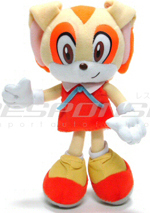 You cannot buy direct from the KellyToy Site. Toyglobe.com is known to sell at least 1 of the sizes. 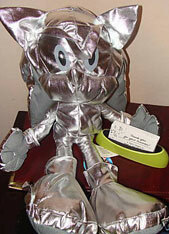 Silver plush photo found by #X, Sonic & Shadow discovered by ShadowWorld. excessively flat, even Knuckles, who's trademarks ARE his fists. Tails' tails are also flat-ish and everyone is very tall and thin. The faces are not outrageous or horrible, though Cream is cross-eyed. They're above ToyNetwork but there's still some to be desired. 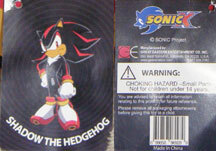 Notice the tag: it has die-cut jumping Sonic at the end, and the Sonic logo, but it does NOT use "Sonic X" anywhere. Do mind this as likely more sizes will be released. Group & Cream photos provided by SonicHOG Super Sonic didn't fare much better than Silver, but at least his shiny color is somewhat appropriate. This can be found at Six Flags Over Texas, as a skill game prize. The giant version is available there. With this photo, you can see all the sizes Kelly Toy makes all lined up. 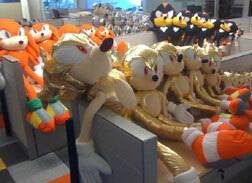 Who would have this many of Silver (he's in back) Shadow, Knuckles and Super Sonic? 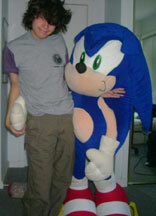 Sega...which is who took this photo. You can see they have a great range of size all the way from person-size to very miniature (that Shadow on the far right is almost too small to be seen in the photo...yes there's one AFTER the last one you see on the arm) Here, they're displayed on benches.